The Cardiovascular Dynamics Lab focuses on cardiovascular physiology, with a major emphasis on cardiovascular dynamics relating to cardiac devices and surgical interventions to treat heart failure. Research strengths include (1) extensive experience in animal experiments using cardiac devices, including right and left ventricular assist devices (RVAD and LVAD) and total artificial hearts (TAHs); (2) established methodology to evaluate cardiac performance; and (3) close collaboration with Cleveland Clinic's Departments of Thoracic and Cardiovascular Surgery and Cardiovascular Medicine. Within Cleveland Clinic's Department of Biomedical Engineering, the Cardiovascular Dynamics laboratory is pioneering surgical and device treatments for heart failure. We are investigating mechanical support devices such as implantable heart pumps (ventricular assist devices) and the total artificial heart. Advanced heart valves, novel chest drainage tubes, cameras to see inside the beating heart, and nerve stimulation are under development. We strive to improve the health of patients with heart disease. Working with the support of the NIH, Cleveland Clinic Innovations, and industry, we are advancing the treatment and understanding of heart failure. 1. Sunagawa G, Karimov JH, Dessoffy R, Byram N, Grady P, Sinkewich M, Naber JP, Vincent D, Okano S, Stewart R, Sale S, Moazami N, Fukamachi K. New technology mimics physiologic pulsatile flow during cardiopulmonary bypass. Artif Organs 2018;42:231-239. 2. Miyamoto T, Karimov JH, Fukamachi K. Effects of continuous and pulsatile flows generated by ventricular assist devices on renal function and pathology. Expert Rev Med Devices 2018:15;171-182. 3. Takaseya T, Fumoto H, Zhu J, Shiose A, Kobayashi M, Fujiki M, Arakawa Y, Dessoffy R, Kramer LD, Fukamachi K. Acute swine model for assessing biocompatibility of biomedical interface materials. Tissue Engineering, Part C: Methods 2018;24:69-73. 4. Fukamachi K, Karimov JH, Horvath DJ, Sunagawa G, Byram NA, Kuban BD, Moazami N. Initial in vitro testing of a pediatric continuous-flow total artificial heart. Interact CardioVasc Thorac Surg 2018;26:897-901. 5. Karimov JH, Horvath DJ, Byram NA, Sunagawa G, Kuban BD, Gao S, Dessoffy R, Fukamachi K. Early in vivo experience with the pediatric continuous-flow total artificial heart. J Heart Lung Transplant 2018;37:1029-1034. 6. Miyamoto T, Karimov JH, Xanthopoulos A, Starling, RC, Fukamachi K. Large animal models to test mechanical circulatory support devices. Drug Discov Today: Dis Models 2018;24:47-53(Summer 2017). 7. Fukamachi K, Karimov JH, Byram N, Sunagawa G, Dessoffy R, Miyamoto T, Horvath DJ. Anatomical study of the Cleveland Clinic continuous-flow total artificial heart in adult and pediatric configurations. J Artif Organs 2018;21:383–386. 8. Karimov JH, Such KA, Dessoffy R, Fukamachi K. Lumbar muscle atrophy caused by harness replacement in a chronic calf model of total artificial heart implantation. J Artif Organs 2018:21:482-485. 9. Sunagawa G, Karimov JH, Breitbach M, Fukamachi K. Reply to Rescigno et al. [Letter to the Editor Response] Eur J Cardiothorac Surg 2018;54:197-198. 10. Takuma M, Karimov JH, Fukamachi K. Short-Term Ventricular Assist: Current and Future Devices. Ventricular Assist Devices: Management, Outcomes and Complications. Nova Science Publishers 2018, p. 1-92. 12. Horvath DJ, Karimov JH, Byram NA, Kuban BD, Sunagawa G, Moazami N, Fukamachi K. Advantages of integrating pressure-regulating devices into mechanical circulatory support pumps. ASAIO J (in press). 13. Horvath DJ, Horvath DW, Karimov JH, Byram N, Kuban BD, Miyamoto T, Fukamachi K. Use of a mechanical circulatory support simulation to study pump interactions with the variable hemodynamic environment. Artif Organs (in press). 14. Miyamoto T, Horvath DJ, Horvath DW, Karimov JH, Byram N, Kuban BD, Fukamachi K. Simulated performance of the Cleveland Clinic continuous-flow total artificial heart using the virtual mock loop. ASAIO J (in press). 15. Karimov JH, Mihaljevic T, Gao S, Sunagawa G, Grady P, Sinkewich M, Fukamachi K. New cardioscope-based platform for minimally invasive and percutaneous beating heart interventions. Semin Thorac Cardiovasc Surg (in press). 16. Alvarez PA, Byram N, Williams JB, Jacob M, Kreiss M, Fukamachi K, Moazami N. Transient power elevation during iron dextran infusion in a patient with a continuous-flow left ventricular assist device. Int J Artif Organs (in press). 17. Kittipibul V, Xanthopoulos A, Hurst TE, Fukamachi K, Blackstone EH, Soltesz E, Starling, RC. Distinctive clinical courses of left ventricular assist device thrombosis. ASAIO J (in press). 1. Sunagawa G, Koprivanac M, Karimov JH, Moazami N, Fukamachi K. Is a pulse absolutely necessary during cardiopulmonary bypass? Expert Rev Med Devices 2017; 14: 27-35. 2. Fukamachi K, Karimov JH, Sunagawa G, Horvath DJ, Byram N, Kuban BD, Dessoffy R, Sale S, Golding LAR, Moazami N. Generating pulsatility by pump speed modulation with continuous-flow total artificial heart in awake calves. J Artif Organs 2017; 20:381–385. 3. Sunagawa G, Karimov JH, Breitbach M, Robinson NA, Fukamachi K. Impact of a refined advanced design for left atrial appendage exclusion. Eur J Cardiothorac Surg 2017;52:1098–1103. 4. Karimov JH, Tong MZ, Byram N, Sunagawa G, Dessoffy R, Moazami N, Starling RC, Fukamachi K. The axial continuous-flow blood pump: Bench evaluation of changes in flow associated with changes of inflow cannula angle. J Heart Lung Transplant 2017;36:106-112. 5. Medvedev AL, Karimov JH, Kuban BD, Horvath DJ, Moazami N, Fukamachi K. Unlocking the box: basic requirements for an ideal ventricular assist device controller. Expert Rev Med Devices 2017; 14: 393-400. 6. Horvath D, Byram N, Karimov JH, Kuban B, Sunagawa G, Golding LAR, Moazami N, Fukamachi K. Mechanism of self-regulation and in vivo performance of the Cleveland Clinic continuous-flow total artificial heart. Artif Organs 2017; 41:411-417. 7. Karimov JH, Horvath DJ, Okano S, Goodin M, Sunagawa G, Byram N, Moazami N, Golding LAR, Fukamachi K. Thrombotic depositions on right impeller of double-ended centrifugal total artificial heart in vivo. Artif Organs 2017; 41: 476-481. 8. Karimov JH, Horvath DJ, Byram N, Sunagawa G, Grady P, Sinkewich M, Moazami N, Sale S, Golding LAR, Fukamachi K. Deairing techniques for double-ended centrifugal total artificial heart implantation. Artif Organs 2017; 41:568-592. 9. Karimov JH, Gao S, Dessoffy R, Sunagawa G, Sinkewich M, Grady P, Sale S, Moazami N, Fukamachi K. Novel technique for airless connection of artificial heart to vascular conduits. J Artif Organs 2017; 20:386-389. 10. Karimov JH, Grady P, Sinkewich M, Sunagawa G, Dessoffy R, Byram N, Moazami N, Fukamachi K. Moderate hypothermia technique for chronic implantation of a total artificial heart in calves. J Artif Organs 2017; 20:182-185. 11. Sunagawa G, Koprivanac M, Karimov JH, Moazami N, Fukamachi K. Current status of mechanical circulatory support for treatment of advanced end-stage heart failure: Successes, shortcomings and needs. Expert Rev Cardiovasc Ther 2017;15: 377-387. 12. Karimov JH, Okano S, Fukamachi K. Continuous-flow mechanical circulation: Current technology insights. In Vaughn W, Hector J, ed. Centrifugal Pumps: Characteristics, Uses and Performance. Nova Science Publishers 2017, p. 225-256. 13. Sunagawa G, Fukamachi K. [Introduction of Cleveland Clinic, Lerner Research Institute, Department of Biomedical Engineering]. [Japanese] Jinkouzouki 2017;46:79-80. 1. Sunagawa G, Horvath DJ, Karimov JH, Moazami N, Fukamachi K. Future prospects for the total artificial heart. Expert Rev Med Devices 2016;13;191-201. 3. Karimov JH, Sunagawa G, Horvath DJ, Fukamachi K, Starling RC, Moazami N. Limitations to chronic right ventricular assist device support. Ann Thorac Surg 2016;102:651-658. 4. Fukamachi K, Horvath DJ, Byram N, Sunagawa G, Karimov JH, Moazami N. Advanced ventricular assist device with pulse augmentation and automatic regurgitant-flow shut-off. J Heart Lung Transplant 2016;35:1519-1521. 5. Karimov JH, Moazami N, Sunagawa G, Kobayashi M, Byram N, Sale S, Such K, Horvath DJ, Golding LAR, Fukamachi K. Median sternotomy or right thoracotomy techniques for total artificial heart implantation. Artif Organs 2016;40:1022-1027. 6. Sunagawa G, Byram N, Karimov J, Horvath DJ, Moazami N, Starling RC, Fukamachi K. The contribution to hemodynamics even at very low pump speeds in HVAD. Ann Thorac Surg 2016;101:2260-2264. 1. Sunagawa G, Byram N, Karimov K, Horvath DJ, Moazami N, Starling RC, Fukamachi K. In vitro hemodynamic characterization of HeartMate II at 6,000 rpm: Implications for weaning and recovery. J Thorac Cardiovasc Surg 2015;150:343-348. 3. Moazami N, Dembitsky WP, Adamson R, Steffen RJ, Soltesz EG, Starling RC, Fukamachi K. Does pulsatility matter in the era of continuous-flow blood pumps? J Heart Lung Transplant 2015;34:999-1004. 4. Karimov JH, Moazami N, Kobayashi M, Sale S, Such K, Byram N, Sunagawa G, Horvath D, Gao S, Kuban B, Golding LAR, Fukamachi K. First report of 90-day support of two calves with a continuous-flow total artificial heart. J Thorac Cardiovasc Surg 2015;150:687-693. 5. Karimov JH, Horvath D, Sunagawa G, Byram N, Moazami N, Golding LA, Fukamachi K. Post-explant visualization of thrombi in outflow grafts and their junction to a continuous-flow total artificial heart using a high-definition miniaturized camera. J Artif Organs 2015;18:354-357. doi: 10.1007/s10047-015-0839-8. Epub 2015 May 5. 7. Karimov JH, Steffen RJ, Byram N, Sunagawa G, Horvath D, Cruz V, Golding LAR, Fukamachi K, Moazami N. Human fitting studies of Cleveland Clinic continuous-flow total artificial heart. ASAIO J 2015;61:424-428. 8. Karimov JH, Sunagawa G, Golding LAR, Moazami N, Fukamachi K. Double-wire sternal closure technique in bovine animal models for total artificial heart implant. Int J Artif Organs 2015; 38:465-467. 1. Fumoto H, Shiose A, Flick CR, Noble LD, Dudzinski DT, Casas F, Takaseya T, Arakawa Y, Fukamachi K, Smith WA, Duncan BW. Short-term in vivo performance of the Cleveland Clinic PediPump left ventricular assist device. Artif Org 2014;38:374-382. 2. Tuna EE, Karimov JH, Liu T, Bebek O, Fukamachi K, Cavusoglu MC. Towards active tracking of beating heart motion in the presence of arrhythmia for robotic assisted beating heart surgery. PLoS One 2014;9:e102877. 3. Steffen RJ, Halbreiner MS, Zhang L, Fukamachi K, Soltesz EG, Starling RC, Moazami N. Mechanical circulatory support for the right ventricle in the setting of a left ventricular assist device. Expert Rev Med Devices 2014;11:587-593 . 4. Karimov JH, Dessoffy R, Kobayashi M, Dudzinski DT, Klatte RS, Kattar J, Moazami N, Fukamachi K. Motion-activated prevention of clogging and maintenance of patency of indwelling chest tubes. Interact CardioVasc Thorac Surg 2014;19:1-5. 1. Fukamachi K, Shiose A, Massiello AL, Horvath DJ, Lee S, Starling RC. Preload sensitivity in cardiac assist devices. Ann Thorac Surg 2013;95:373-380. 2. Moazami N, Hoercher KJ, Fukamachi K, Kobayashi M, Smedira NG, Massiello A, Horvath DJ. Mechanical circulatory support for heart failure: Past, present, and a look at the future. Expert Rev Med Devices 2013;10:55-71. 3. Karimov JH, Massiello A, Fukamachi K. Overview of current sutureless and transcatheter mitral valve replacement technology. Expert Rev Med Devices 2013;10:73-83. 4. Moazami N, Fukamachi K, Kobayashi M, Smedira NG, Hoercher KJ, Massiello A, Lee S, Horvath DJ, Starling RC. Axial and centrifugal continuous-flow rotary pumps: A translation from pump mechanics to clinical practice. J Heart Lung Transplant 2013;32:1-11. 5. Tuna EE, Franke TJ, Bebek O, Shiose A, Fukamachi K, Cavusoglu MC. Heart motion prediction based on adaptive estimation algorithms for robotic-assisted beating heart surgery. IEEE Trans Robot 2013;29: 261-276. 6. Lee S, Fukamachi K, Golding LAR, Moazami N, Starling RC. Left ventricular assist devices: From the bench to the clinic. Cardiology 2013;125:1-12. 7. Ootaki C, Yamashita M, Ootaki Y, Saeed D, Horai T, Fumoto H, Massiello AL, Emancipator SN, Golding LAR, Fukamachi K. Periarteritis in lung from a continuous-flow right VAD: Role of the local renin-angiotensin system. Ann Thorac Surg 2013;96:148-154. 8. Kobayashi M, Massiello Karimov JH, Van Wagoner DR, Fukamachi K. Cardiac autonomic nerve stimulation in the treatment of heart failure. Ann Thorac Surg 2013;96:339-345. 9. Fukamachi K. Current status of artificial heart (assist/replacement) development in the United States. Artif Org 2013;37:675-676. 10. Karimov JH, Gillinov AM, Schenck L, Cook M, Kosty Sweeney D, Boyle EM, Fukamachi K. Incidence of chest tube clogging after cardiac surgery: A single-center prospective observational study. Eur J Cardiothorac Surg 2013;44:1029-1036. 1. Saeed D, Fukamachi K, Duncan BW. Intraoperative fitting study of the PediPump ventricular assist device. J Heart Lung Transplant 2012;31:109-110. 2. Karimov JH, Kobayashi M, Fukamachi K. Functional mitral regurgitation: Modern concepts for ventricular geometry reshaping. Expert Rev Med Devices 2012:9:131-138. 3. Fukamachi K, Shiose A, Massiello AL, Horvath DJ, Golding LAR, Lee S, Starling RC. Implantable continuous-flow right ventricular assist device: Lessons learned in development of a Cleveland Clinic device. Ann Thorac Surg 2012;93:1746-1752. 4. Young EY, Fukamachi K. Transcatheter aortic valve technology: current state. Recent Patents Biomed Eng 2012;5:114-121. 5. Fumoto H, Gillinov AM, Saraiva R, Horai T, Anzai T, Takaseya T, Shiose A, Arakawa Y, Vince DG, Dessoffy R, Fukamachi K. Left atrial appendage occlusion: Pilot study of a fourth-generation, minimally invasive device. Innovations 2012;7:195-200. 6. Kobayashi M, Horvath DJ, Mielke N, Shiose A, Kuban B, Goodin M, Fukamachi K, Golding LAR. Progress on the design and development of the continuous-flow total artificial heart. Artif Organs 2012;36:705-713. 7. Kobayashi M, Sakurai S, Takaseya T, Shiose A, Kim HI, Fujiki M, Karimov JH, Dessoffy R, Massiello A, Borowski A, Van Wagoner DR, Jung E, Fukamachi K. Effect of epivascular cardiac autonomic nerve stimulation on cardiac function. Ann Thorac Surg 2012;94:1150-1156. 8. Kobayashi M, Sakurai S, Takaseya T, Shiose A, Kim HI, Fujiki M, Karimov JH, Dessoffy R, Massiello A, Borowski A, Van Wagoner DR, Jung E, Fukamachi K. Effects of percutaneous stimulation of both sympathetic and parasympathetic cardiac autonomic nerves on cardiac function. Innovations 2012;7:282-289. 9. Takaseya T, Fujiki M, Shiose A, Kim HI, Kobayashi M, Massiello AL, Dessoffy R, Al-Ruzzeh S, Fukamachi K. Hemodynamic differences between the awake and anesthetized conditions in normal calves. J Artif Organs 2012;15:225-230. 10. Takaseya T, Al-Ruzzeh S, Fukamachi K. Current percutaneous coronary sinus mitral annuloplasty devices in patients with dilated cardiomyopathy. In Navia JL, Al-Ruzzeh S, ed. Percutaneous Valve Technology: Present and Future. Nova Science Publishers 2012, p. 461-472. 1. Fumoto H, Chen JF, Zhou Q, Massiello AL, Dessoffy R, Fukamachi K, Navia JL. Performance of bioprosthetic valves after glycerol dehydration, ethylene oxide sterilization, and rehydration. Innovations 2011;6:32-36. 2. Arakawa Y, Shiose A, Takaseya T, Fumoto H, Kim HI, Boyle EM, Gillinov AM, Fukamachi K. Superior chest drainage with an active tube clearance system: Evaluation of a downsized chest tube. Ann Thorac Surg 2011;91:580-583. 3. Fawzy H, Fukamachi K, Mazer CD, Harrington A, Latter D, Bonneau D, Errett L. Complete mapping of the tricuspid valve apparatus using three-dimensional sonomicrometry. J Thorac Cardiovasc Surg 2011;141:1037-1043. 4. Horai T, Fukamachi K, Fumoto H, Takaseya T, Shiose A, Arakawa Y, Rao S, Dessoffy R, Mihaljevic T. Direct endoscopy-guided mitral valve repair in the beating heart: Acute animal study. Innovations 2011;6:122-125. 5. Shiose A, Takaseya T, Fumoto H, Horai T, Kim HI, Fukamachi K, Mihaljevic T. Cardioscopy-guided surgery: intracardiac mitral and tricuspid valve repair under direct visualization in the beating heart. J Thorac Cardiovasc Surg 2011;142:199-202. 6. Karimov JH, Fukamachi K. Current trends in the surgical armamentarium for minimally invasive heart valve therapies. Recent Patents Biomed Eng 2011;4:56-67. 7. Shiose A, Takaseya T, Kim HI, Kobayashi M, Horai T, Rao S, Arakawa Y, Fujiki M, McCarthy MA, Liu Y, Lewandowski JJ, Davis A, Fukamachi K. In Vivo evaluation of a new surfactant polymer coating mimicking the glycocalyx of endothelial cells. ASAIO J 2011:57:395-398. 8. Young E, Chen J-F, Dong O, Gao S, Massiello A, Fukamachi K. Transcatheter heart valve with variable geometric configuration: In vitro evaluation. Artif Organs 2011;35:1151-1159. 1. Fukamachi K, Horvath DJ, Massiello AL, Fumoto H, Horai T, Rao S, Golding LAR. An innovative, sensorless, pulsatile, continuous flow total artificial heart: Device design and initial in vitro study. J Heart Lung Transplant 2010;29:13 - 20. 2. Fumoto H, Horvath DJ, Rao S, Massiello AL, Horai T, Takaseya T, Arakawa Y, Mielke N, Chen J-F, Dessoffy R, Fukamachi K, Golding LAR. In vivo acute performance of the Cleveland Clinic self-regulating continuous-flow total artificial heart. J Heart Lung Transplant 2010;29:21 - 26. 3. Saeed D, Massiello A, Shalli S, Fumoto H, Horai T, Anzai T, Golding LAR, Fukamachi K. Introduction of fixed-flow mode in the DexAide right ventricular assist device. J Heart Lung Transplant 2010;29:32 - 36. 4. Takaseya T, Fumoto H, Saraiva R, Shiose A, Arakawa Y, Park M, Rao S, Dessoffy R, Kramer LD, Jr., Juravic M, Lombardi P, Fukamachi K. Acute feasibility study of a novel device for the treatment of mitral regurgitation in a normal canine model. Innovations 2010;5:28 - 32. 5. Shalli S, Boyle EM, Saeed D, Fukamachi K, Cohn WE, Gillinov AM. The active tube clearance system: A novel bedside chest-tube clearance device. Innovations 2010;5:42 - 47. 6. Saeed D, Horvath DJ, Massiello AL, Ootaki Y, Benefit S, Golding LAR, Fukamachi K. Use of zirconia ceramic in the DexAide right ventricular assist device journal bearing. Artif Organs 2010;34:146-149. 7. Zahr R, Saeed D, Fumoto H, Horai T, Shalli S, Anzai T, Arakawa Y, Dessoffy R, Catanese J, Massiello A, Litwak KN, Fukamachi K. A pilot study for inducing chronic heart failure in calves by means of oral monensin. Int J Biomed Sci 2010;6:1-7. 8. Shiose A, Takaseya T, Fumoto H, Arakawa Y, Horai1 T, Boyle EM, Gillinov AM, Fukamachi K. Improved drainage with active tube clearance. Interact CardioVasc Thorac Surg 2010;10:685-688. 9. Riley AA, Arakawa Y, Worley S, Duncan BW, Fukamachi K. Circulating blood volumes: A review of measurement techniques and a meta-analysis in children. ASAIO J 2010;56:260-264. 10. Takaseya T, Shiose A, Saraiva RM, Fumoto H, Arakawa Y, Juravic M, Lombardi P, Fukamachi K. Novel epicardial off-pump device for mitral regurgitation: Acute evaluation. Eur J Cardiothorac Surg 2010;37:1291-1296. 11. Fujiki M, Shiose A, Fukamachi K. Recent advances and patents on chest drainage systems. Recent Patents Biomed Eng 2010;3:115-120. 12. Mielke NA, Massiello AL, Horvath DJ, Benefit SM,Burgess D, Golding LAR, Fukamachi K. In vitro evaluation of a new resilient, hard-carbon, thin-film coating as a bearing material for ventricular assist devices. J Biomed Sci Eng 2010;3:525-528. 13. Saeed D, Shalli S, Fumoto H, Ootaki Y, Horai T, Anzai T, Zahr R, Horvath DJ, Massiello AL, Chen JF, Dessoffy R, Catanese J, Benefit S, Golding LA, Fukamachi K. In vivo evaluation of zirconia ceramic in the DexAide right ventricular assist device journal bearing. Artif Organs 2010;34:512-516. 14. Fumoto H, Takaseya T, Shiose A, Saraiva RM, Arakawa Y, Park M, Rao S, Dessoffy R, Chen J-F, Zhou Q, Calabro A, Jr., Banbury M, Fukamachi K. Mitral annular remodeling to treat functional mitral regurgitation: An acute pilot study in a canine model. Heart Surg Forum 2010:13;E247-E250. 15. Shiose A, Nowak K, Horvath DJ, Massiello AL, Golding LAR, Fukamachi K. Speed modulation of the continuous-flow total artificial heart to simulate a physiologic arterial pressure waveform. ASAIO J 2010;56:403-409. 16. Shiose A, Kim H, Takaseya T, Kobayashi M, Fujiki M, Chen J, Klatte R, Gao S, Massiello AL, Saeed D, Fukamachi K. Performance of extracorporeally adjustable ventricular assist inflow cannula. Ann Thorac Surg 2010;90:1682-1687. 17. Fumoto H, Gillinov AM, Vince DG, Akiyama M, Saeed D, Fukamachi K. Histological evaluation of stapled right atrial appendages with fabric buttressing. Innovations 2010;5:359-363. 18. Navia JL, Brozzi NA, Doi K, Garcia M, Al-Ruzzeh S, Atik FA, Fukamachi K, Xu X-F, Kamohara K, Gonzalez-Stawinski GV, Lytle B. Implantation technique and early echocardiographic performance of newly designed stentless mitral bioprosthesis. ASAIO J 2010;56:497-503. 19. Takaseya T, Fumoto H, Shiose A, Arakawa Y, Rao S, Horvath DJ, Massiello AL, Mielke N, Chen J-F, Zhou Q, Dessoffy R, Kramer L, Benefit S, Golding LAR, Fukamachi K. In vivo biocompatibility evaluation of a new resilient, hard-carbon, thin-film coating for ventricular assist devices. Artif Organs 2010;34:1158-1163. 20. Kobayashi M, Al-Ruzzeh S, Navia JL, Fukamachi K. Recent advances and patents on coronary sinus perfusion devices for treatment of heart disease. Recent Patents Biomed Eng 2010:3;147-152. 1. Manzo A, Ootaki Y, Ootaki C, Kamohara K, Fukamachi K. Comparative study of heart rate variability between healthy human subjects and healthy dogs, rabbits, and calves. Lab Anim 2009 ;43:41 -45. 2. Saeed D, Fukamachi K. In vivo preclinical anticoagulation regimens after implantation of ventricular assist devices. Artif Organs 2009 ;33:491 -503. 3. Ootaki Y, Ootaki C, Massiello A, Horvath D, Chen J-F, Mihaljevic T, Navia JL, Smedira NG, Golding LAR, Fukamachi K. Human clinical fitting study of the DexAide right ventricular assist device. Artif Organs 2009 ;33:558 -561. 4. Horai T, Fumoto H, Saeed D, Zahr R, Anzai T, Arakawa Y, Shalli S, Ootaki C, Catanese J, Akiyama M, Tan CD, Rodriguez ER, Young JB, Fukamachi K. Novel implantable device to detect cardiac allograft rejection. Circulation 2009 ;120 [ suppl 1]:S185 - S190. 5. Shiose A, Fukamachi K. Recent advances and patents on circulatory support devices for pediatric patients. Recent Patents Biomed Eng 2009 ;2:161 -164. 6. Shalli S, Saeed D, Fukamachi K, Gillinov AM, Cohn WE, Perrault LP, Boyle EM. Chest tube selection in cardiac and thoracic surgery: A survey of chest tube-related complications and their management. J Card Surg 2009 ;24:503 -509. 7. Deshpande A, Dombrowski SM, Leichliter A, Krajcir N, Zingales N, Inoue M, Schenk S, Fukamachi K, Luciano MG. Dissociation between vascular endothelial growth factor receptor-2 and blood vessel density in the caudate nucleus after chronic hydrocephalus. J Cereb Blood Flow Metab2009 ;29:1806 -1815. 8. Duncan BW, Fukamachi K, Noble LD, Jr., Dudzinski DT, Flick CR, Fumoto H, Shiose A, Arakawa Y, Takaseya T, Casas F, Smith WA. The PediPump: A versatile, implantable, pediatric ventricular assist device - Update IV. Artif Organs 2009 ;33:1005 -1008. 1. Saeed D, Ootaki Y, Ootaki C, Akiyama M, Horai T, Catanese J, Fumoto H, Dessoffy R, Massiello AL, Horvath DJ, Zhou Q, Chen JF, Benefit S, Golding LAR, Fukamachi K. Acute in vivo evaluation of an implantable continuous flow biventricular assist system. ASAIO J 2008;54:20-24. 2. Ootaki Y, Saeed D, Ootaki C, Akiyama M, Fumoto H, Horai T, Dessoffy R, Catanese J, Massiello A, Horvath D, Chen JF, Benefit S, Golding LAR, Fukamachi K. Development of the DexAide right ventricular assist device inflow cannula. ASAIO J 2008;54:31-36. 3. Flick CR, Weber S, Luangphakdy V, Klatte RS, Fukamachi K, Smith WA . Pressures generated within the chambers of the MagScrew TAH: An in-vitro study. ASAIO J 2008;54:58-63. 4. Saeed D, Ootaki Y, Noecker A, Weber S, Smith WA, Duncan B, Fukamachi K. The Cleveland Clinic PediPump: Virtual fitting studies in children using three-dimensional reconstructions of cardiac computed tomography scans. ASAIO J 2008; 54:133-137. 5. Fukamachi K, Ootaki Y, Ootaki C, Akiyama M, Kamohara K, Cingoz F, Horvath DJ, Chen JF, Massiello AL, Dessoffy R. Innovative, replaceable heart valve: Concept, in vitro study, and acute in vivo study. Artif Organs 2008;32:226-239. 6. Mihaljevic T, Ootaki Y, Robertson JO, Durrani AK , Kamohara K, Akiyama M, Cingoz F, Ootaki C, Dessoffy R, Kopcak M, Liu J, Fukamachi K. Beating heart cardioscopy: a platform for real-time, intracardiac imaging. Ann Thorac Surg 2008;85:1061-1066. 7. Fukamachi K. Percutaneous and off-pump treatments for functional mitral regurgitation. J Artif Organs 2008;11:12-18. 8. Akiyama M, Popovic ZB, Kamohara K, Cingoz F, Daimon M, Ootaki C, Ootaki Y, Martin M, Liu J, Kopcak MW, Jr., Dessoffy R, Fukamachi K. Acute reduction of functional mitral regurgitation in canine model using an epicardial device. Ann Thorac Surg 2008;85:1771-1775. 9. Ootaki C, Yamashita M, Ootaki Y, Kamohara K, Weber S, Klatte RS, Smith WA, Massiello AL, Emancipator SN, Golding LAR, Fukamachi K. Reduced pulsatility induces periarteritis in kidney and the role of the local renin-angiotensin system. J Thorac Cardiovasc Surg 2008;136:150-158. 10. Litwak KN, Unger LS, Fukamachi K, Saeed D. Retrospective analysis of adverse events in preclinical VAD experiments. ASAIO J 2008;54:347-350. 11. Shalli S, Saeed D, Fukamachi K. Recent advances and patents on mechanical circulatory support devices. Recent Patents Biomed Eng 2008;1:127-135. 12. Ootaki Y, Ootaki C, Kamohara K, Akiyama M, Zahr F, Kopcak MW, Jr., Dessoffy R, Fukamachi K. Phasic coronary blood flow patterns in dogs vs. pigs: An acute ischemic heart study. Med Sci Monit 2008;14:BR193-197. 13. Fumoto H, Gillinov AM, Ootaki Y, Akiyama M, Saeed D, Horai T, Ootaki C, Vince DG, Popovic ZB, Dessoffy R, Massiello A, Catanese J, Fukamachi K. A novel device for left atrial appendage exclusion: The third-generation atrial exclusion device. J Thorac Cardiovasc Surg 2008;136:1019-1027. 14. Catanese J, Anzai T, Fukamachi K. Recent advances and patents on novel devices for minimally invasive treatment of functional mitral regurgitation. Recent Patents Biomed Eng 2008;3:197-202. 15. Saeed D, Zahr R, Shalli S, Fumoto H, Horai T, Anzai T, Arakawa Y, Dessoffy R, Catanese J, Golding LAR, Fukamachi K. Median sternotomy approach for chronic bovine experiments. ASAIO J 2008;54:585-588. 16. Fukamachi K, Saeed D, Massiello AL, Horvath DJ, Fumoto H, Horai T, Zahr R, Shalli S, Anzai T, Dessoffy R, Catanese J, Chen JF, Zhou Q, Benefit S, Alfini S, Golding LA. Development of DexAide right ventricular assist device: Update II. ASAIO J 2008; 54:589-593. 17. Ootaki C, Manzo A, Kamohara K, Popovic Z, Fukamachi K, Ootaki Y. Heart rate variability in progressive heart failure model by rapid ventricular pacing. Heart Surg Forum 2008;11:E295- E299. 18. Fukamachi K. Possible magnet fields effects from an innovative, replaceable magnetic heart valve. [Reply to the editor] Artif Organs 2008;32:999-1000. 19. Zahr F, Ootaki Y, Starling RC, Smedira NG, Yamani M, Thuita L, Fukamachi K. Preoperative risk factors for mortality after biventricular assist device implantation. J Card Fail 2008;14:844-849. 1. Ootaki Y, Kamohara K, Akiyama M, Zahr F, Kopcak MW, Jr., Dessoffy R, Fukamachi K. Ventral cardiac denervation increased right coronary arterial blood flow. Int J Cardiol Int J Cardiol 2007 ;114:309 -314. 2. Kamohara K, Popovic ZB, Daimon M, Martin M, Ootaki Y, Akiyama M, Zahr F, Cingoz F, Ootaki C, Kopcak MW, Jr., Dessoffy R, Liu J, Thomas JD, Gillinov AM, Fukamachi K. Impact of left atrial appendage exclusion on left atrial function. J Thorac Cardiovasc Surg 2007 ;133:174 -181. 3. Navia JL, Doi K, Atik FA, Fukamachi K, Kopcak MW, Jr., Dessoffy R, Ruda -Vega P, Garcia M, Houghtaling PL, Martin M, Blackstone EH, McCarthy PM, Lytle BW. Acute in vivo evaluation of a new stentless mitral valve. J Thorac Cardiovasc Surg 2007 ;133:986 -994. 4. Cingoz F, Yanulis G, Ching E, Fukamachi K, Wallick DW. Use of conventional dual chamber pacemakers with custom lead adapters to induce atrial fibrillation or heart failure in dogs. Ann Thorac Surg 2007 ;83:1858 -1862. 5. Cingoz F, Fukamachi K, Ootaki Y, Kamohara K, Akiyama M, Ootaki C, Kopcak MW, Liu J, Noecker A, Dudzinski D, Smith WA , Duncan B. Cleveland Clinic PediPump lamb cadaver fitting studies. Artif Organs 2007 ;31:405 -408. 6. Ootaki Y, Ootaki C, Kamohara K, Akiyama M, Cingoz F, Kopcak MW, Jr., Dessoffy R, Liu J, Massiello A, Horvath D, Chen JF, Zhou Q, Benefit S, Golding LAR, Fukamachi K. Cadaver fitting study of the DexAide right ventricular assist device. Artif Organs 2007 ;31:646 -658. 7. Kamohara K, Popovic ZB, Gillinov AM, Fukamachi K. Left atrial appendage exclusion - A role in stroke prevention? [Reply to the editor] J Thorac Cardiovasc Surg 2007 ;134:550 . 8. Kamohara K, Weber S, Klatte RS, Luangphakdy V, Flick CR, Ootaki Y, Akiyama M, Cingoz F, Ootaki C, Kopcak MW, Jr., Liu J, Chen Ji -F, Navia JL, Smith WA, Fukamachi K. Hemodynamic and metabolic changes during exercise in calves with total artificial hearts of different sizes yet similar output. Artif Organs 2007 ;31:667 -676. 9. Ootaki Y, Yoshimura N, Fukamachi K. Long graft stumps: A safe approach? [Letter] Ann Thorac Surg 2007 ;84:1798 -1799. 10. Noecker AM, Cingoz F, Ootaki Y, Liu J, Kuzmiak S, Kopcak MW, Fukamachi K, Duncan BW. The Cleveland Clinic PediPump: Anatomic modeling and virtual fitting studies in a lamb model. ASAIO J 2007 ;53:716 -719. 11. Weber S, Dudzinski DT, Gu L, Mielke N, Casas F, Noecker AM, Saeed D, Ootaki Y, Fukamachi K, Smith WA, Duncan BW. The PediPump: A versatile, implantable, pediatric ventricular assist device - Update III. ASAIO J 2007 ;53:730 -733. 12. Saeed D, Weber S, Ootaki Y, Mielke N, Ootaki C, Akiyama M, Horai T, Catanese J, Fumoto H, Dessoffy R, Dudzinski DT, Gu L, Casas F, Smith WA, Fukamachi K, Duncan BW. Initial acute in vivo performance of the Cleveland Clinic PediPump left ventricular assist device. ASAIO J 2007 ;53:766 -770. 1. Ootaki Y, Kamohara K, Schenk S, Kopcak M, Dessoffy R, Graham L, Fukamachi K. Experimental study of new diagnostic system for coronary artery disease using coronary transit index. Int J Cardiol 2006 ;106:55 -60. 2. Schenk S, McCarthy PM, Blackstone EH, Feng J, Starling RC, Navia JL, Zhou L, Hoercher KJ, Smedira NG, Fukamachi K. Duration of inotropic support after left ventricular assist device implantation: Risk factors and impact on outcome. J Thorac Cardiovasc Surg 2006 ;131:447 -454. 3. Ootaki Y, Kamohara K, Schenk S, Kopcak MW, Jr., Dessoffy R, Schoenhagen P, Fukamachi K. Transmural distribution of myocardial blood perfusion and phasic coronary blood flow pattern in a canine model of acute ischemia. Int J Cadiol 2006 ;107:382 -388. 4. Schenk S, Weber S, Smith WA , Fukamachi K. MagScrew total artificial heart. [Letter] Ann Thorac Surg 2006 ;81:2338 -2339. 5. Kamohara K, Fukamachi K, Gillinov AM. Stroke prevention by epicardial occlusion of the left atrial appendage. [Reply to the editor] J Thorac Cardiovasc Surg 2006 ;132:208 . 6. Popovic ZB, Richards KE, Greenberg NL, Rovner A, Drinko J, Cheng Y, Penn MC, Fukamachi K, Mal N, Levine BD, Garcia MJ, Thomas JD. Scaling of diastolic intraventricular pressure gradients is related to filling time duration. Am J Physiol Heart Circ Physiol 2006 ;291:H762 -H769. 7. Kamohara K, Weber S, Klatte RS, Ootaki Y, Akiyama M, Kopcak MW, Jr., Luangphakdy V, Flick CR, Chen Ji -F, Navia JL, Smith WA, Fukamachi K. Replacement of the left-side valves of an implanted total artificial heart. ASAIO J 2006 ;52:368 -372. 8. Kamohara K, Fukamachi K, Ootaki Y, Akiyama M, Cingoz F, Ootaki C, Vince DG, Popovic ZB, Kopcak MW, Jr., Dessoffy R, Liu J, Gillinov AM. Evaluation of a novel device for left atrial appendage exclusion: The second generation atrial exclusion device. J Thorac Cardiovasc Surg 2006 ;132:340 -346. 9. Ootaki Y, Yamada H, Daimon M, Kamohara K, Popovic Z, Van Wagoner DR, Cheng Y, Fukamachi K. An experimental rabbit model for off-pump left ventricular reconstruction following left ventricular aneurysm. Heart Surg Forum 2006 ;9:E786 -E791. 10. Duncan BW, Dudzinski DT, Gu L, Mielke N, Noecker AM, Kopcak MW, Fukamachi K, Cingoz F, Ootaki Y, Smith WA. The PediPump: Development status of a new pediatric ventricular assist device: Update II. ASAIO J 2006;52:581-587. 11. Dombrowski SM, Schenk S, Leichliter A, Leibson Z, Fukamachi K, Luciano MG. Chronic hydrocephalus-induced changes in cerebral blood flow: mediation through cardiac effects. J Cereb Blood Flow Metab 2006 ;26:1298 -1310. 12. Fukamachi K, Ootaki Y, Horvath DJ, Massiello AL, Kamohara K, Akiyama M, Cingoz F, Ootaki C, Kopcak MW, Dessoffy R, Liu J, Chen JF, Zhou Q, Benefit S, Golding LA, Alfini S, Rowe DT. Progress in the development of the DexAide right ventricular assist device. ASAIO J 2006 ;52:630 -633. 13. Kamohara K, Banbury M, Calabro A, Jr., Popovic ZB, Darr A, Ootaki Y, Akiyama M, Cingoz F, Ootaki C, Kopcak MW, Jr., Dessoffy R, Liu J, Fukamachi K. A novel technique for functional mitral regurgitation therapy: Mitral annular remodeling. Heart Surg Forum 2006 ;9:E888 -E892. 14. Ootaki Y, Kamohara K, Horvath DJ, Massiello A, Golding LAR, Lukic B, Weiss WJ, Maruyama O, Fukamachi K. Hemolysis evaluation of centrifugal pumps using microcapsule suspension. Int J Artif Organs 2006 ;29:1185 -1189. 1. Fukamachi K , Inoue M, Popovic ZB, Ootaki Y, Kopcak MW, Jr., Dessoffy R, Thomas JD, McCarthy PM. Optimal mitral annular and sub- valvular shape change created by the Coapsys device to treat functional mitral regurgitation. ASAIO J 2005 ;51:17-21. 2. Fukamachi K , Inoue M, Doi K, Schenk S, Nemeh H, Faber C, Navia JL, McCarthy PM. Reduction of mitral regurgitation using the Coapsys device: A novel ex vivo method using excised recipients’ hearts. ASAIO J 2005 ;51:82-84. 3. Schenk S, Kish DD, He C, El- Sawy T, Chiffoleau E, Chen C, Wu Z, Sandner S, Gorbachev AV, Fukamachi K , Heeger PS, Sayegh MH, Turka LA, Fairchild RL. Alloreactive T cell responses and acute rejection of single class II MHC disparate heart allografts is under strict regulation by CD4+CD25+ T cells. J Immunol 2005 ;174:3741 -3748. 4. Schenk S, Weber S, Luangphakdy V, Klatte RS, Flick CR, Chen J-F, Kopcak MW, Jr., Ootaki Y, Kamohara K, Hirschman GB, Vitale NG, Chapman PA, Jr., Smith WA, Fukamachi K . MagScrew total artificial heart in vivo performance above 200 beats per minute. Ann Thorac Surg 2005 ;79:1378 -1383. 5. Ootaki Y, Fukamachi K . Technique for microsphere injection. J Thorac Cardiovasc Surg 2005 ;129:1203 . 6. Takagaki M, McCarthy PM, Inoue M, Chung M, Connor JT, Dessoffy R, Ochiai Y, Howard M, Doi K, Kopcak M, Mazgalev TN, Fukamachi K. Myocardial compliance was not altered after acute induction of atrial fibrillation in sheep. Med Sci Monit 2005 ;11:BR147 -153. 7. Duncan BW, Lorenz M, Kopcak MW, Fukamachi K , Ootaki Y, Chen HM, Chapman PA, Davis SJ, Smith WA. The PediPump: A new ventricular assist device for children. Artif Organs 2005 ;29:527 -530. 8. Tabata T, Grimm RA, Bauer FJ, Fukamachi K , Takagaki M, Ochiai Y, Mazgalev TN, Wilkoff BL, McCarthy PM, Thomas JD. Giant flow reversal in pulmonary venous flow as a possible mechanism for asynchronous pacing-induced heart failure. J Am Soc Echocardiogr 2005 ;18:722-728. 9. Popovic ZB, Martin M, Fukamachi K , Inoue M, Kwan J, Doi K, Qin JX, Shiota T, Garcia MJ, McCarthy PM, Thomas JD. Mitral annulus size links ventricular dilatation to functional mitral regurgitation. J Am Soc Echocardiogr 2005 ;18:959 -963. 10. Fukamachi K , Smedira NG. Smaller, safer, totally implantable LVAD: Fact or fantasy? ACC Curr J Rev 2005 ;14:40 -44. 11. Duncan BW, Dudzinski DT, Noecker AM, Kopcak MW, Fukamachi K , Ootaki Y, Chen HM, Chapman PA, Davis SJ, Smith WA. The PediPump: Development status of a new pediatric ventricular assist device. ASAIO J 2005 ;51:536-539. 12. Ootaki Y, Kamohara K, Akiyama M, Zahr F, Kopcak MW, Jr., Dessoffy R, Fukamachi K . Phasic coronary blood flow pattern during a continuous flow left ventricular assist support. Eur J Cardiothorac Surg 2005 ;28:711 -716. 13. Fukamachi K, McCarthy, PM. Initial safety and feasibility clinical trial of the Myosplint device. J Card Surg 2005 ;20:S43 -S47. 14. Kamohara K, Fukamachi K , Ootaki Y, Akiyama M, Zahr F, Kopcak MW, Jr., Dessoffy R, Popovic ZB, Daimon M, Cosgrove DM, Gillinov AM . A novel device for left atrial appendage exclusion. J Thorac Cardiovasc Surg 2005 ;130:1639 -1644. 15. Weber S, Kamohara K, Klatte RS, Luangphakdy V, Flick C, Chen Ji -F, Casas F, Ootaki Y, Kopcak M, Akiyama M, Hirschman GB, Chapman PA, Donahue A, Wetterau W, Prisco C, Mast R, Sherman C, Fukamachi K, Smith WA. MagScrew TAH - An update. ASAIO J 2005 ;51:xxxvi -xlvi. 16. Casas F, Reeves A, Dudzinski D, Weber S, Lorenz M, Akiyama M, Kamohara K, Kopcak M, Ootaki Y, Zahr F, Sinkewich M, Foster R, Fukamachi K, Smith WA. Performance and reliability of the CPB/ECMO initiative forward lines casualty management system. ASAIO J 2005 ;51:681-685. 17. Navia JL, Zahr F, Fukamachi K, Goodin M, Ragaller P, Chen Ji -F, Kopcak MW, Jr., Dessoffy R, Ootaki Y, Kamohara K, Akiyama M, Gutierrez A, Navia JA, Atik F, Cosgrove DM . In vitro performance of the novel coronary sinus AutoRetroPerfusion cannula. ASAIO J 2005 ;51:686 -691. 18. Fukamachi K, Horvath DJ, Massiello AL, Ootaki Y, Kamohara K, Akiyama M, Zahr F, Kopcak MW, Jr., Dessoffy R, Chen Ji -F, Benefit S, Golding LAR. Development of a small, implantable right ventricular assist device. ASAIO J 2005 ;51:730 -735. 19. Ootaki Y, Kamohara K, Akiyama M, Zahr F, Kopcak MW, Jr., Dessoffy R, Massiello A, Horvath D, Chen Ji -F, Benefit S, Golding LAR, Fukamachi K. Initial in vivo evaluation of the DexAide right ventricular assist device. ASAIO J 2005 ;51:739 -742. 1. Fukamachi K , Inoue M, Popovic ZB, Doi K, Schenk S, Nemeh H, Ootaki Y, Kopcak MW, Jr., Dessoffy R, Thomas JD, Bianco RW, Berry JM, McCarthy PM. Off-pump mitral valve repair using the Coapsys device; a pilot study in a pacing-induced mitral regurgitation model. Ann Thorac Surg 2004 ;77:688 -693. 2. Fukamachi K , Popovic ZB, Inoue M, Doi K, Schenk S, Ootaki Y, Kopcak MW Jr., McCarthy PM. Changes in mitral annular and left ventricular dimensions and left ventricular pressure-volume relations after off-pump treatment of mitral regurgitation with the Coapsys device. Eur J Cardiothorac Surg 2004 ;25:352 -357. 3. Inoue M, McCarthy PM, Popovic ZB, Doi K, Schenk S, Nemeh H, Ootaki Y, Kopcak Jr MW, Dessoffy R, Thomas JD, Fukamachi K . Mitral valve repair without cardiopulmonary bypass or atriotomy using the Coapsys device: device design and implantation procedure in canine functional mitral regurgitation model. Heart Surg Forum 2004 ;7:117 -121. 4. Inoue M, McCarthy PM, Popovic ZB, Doi K, Schenk S, Nemeh H, Ootaki Y, Kopcak MW Jr., Dessoffy R, Thomas JD, Fukamachi K . The Coapsys device to treat functional mitral regurgitation: in vivo long-term canine study. J Thorac Cardiovasc Surg 2004 ;127:1068 -1077. 5. Popovic ZB, Saracino G, Deserranno D, Yang H, Greenberg NL, Takagaki M, Fukamachi K , Ochiai Y, Inoue M, Schenk S, Doi K, Qin J, McCarthy PM, Shiota T, Thomas JD. Echocardiographic assessment of regional ventricular function after device-based change of left ventricular shape. J Am Soc Echocardiogr 2004 ;17:411 -417. 6. Nakamura K, Harasaki H, Fukumura F, Fukamachi K , Whalen R. Comparison of pulsatile and non-pulsatile cardiopulmonary bypass on regional renal blood flow in sheep. Scand Cardiovasc J 2004 ;38:59 -63. 7. Doi K, Golding LAR, Massiello AL, Kopcak MW Jr., Gerhart RL, Schenk S, Inoue M, Ootaki Y, Fukamachi K . Pre-clinical readiness testing of the Arrow International CorAide � left ventricular assist system. Ann Thorac Surg 2004 ;77:2103 -2110. 8. Schenk S, McCarthy PM, Starling RC, Hoercher KJ, Hail MD, Ootaki Y, Francis GS, Doi K, Young JB, Fukamachi K . Neurohormonal response to left ventricular reconstruction surgery in ischemic cardiomyopathy. J Thorac Cardiovasc Surg 2004 ;128:38 -43. 9. Fukamachi K . New technologies for mechanical circulatory support: Current status and future prospects of CorAide and MagScrew technologies. J Artif Organs 2004 ;7:45 -57. 10. Schenk S, Popovic ZB, Ochiai Y, Casas F, McCarthy PM, Starling RC, Kopcak MW Jr., Dessoffy R, Navia JL, Greenberg NL, Thomas JD, Fukamachi K . Preload-adjusted right ventricular maximal power: concept and validation. Am J Physiol Heart Circ Physiol 2004 ;287:H1632 -H1640. 1. Takagaki M, McCarthy PM, Goormastic M, Ochiai Y, Doi K, Kopcak MW Jr., Tabata T, Cardon LA, Thomas JD, Fukamachi K. Determinants of the development of mitral regurgitation in pacing-induced heart failure. Circ J 2003 ;67:78 -82. 2. Tabata T, Cardon LA, Armstrong GP, Fukamachi K , Takagaki M, Ochiai Y, McCarthy PM, Thomas JD. An evaluation of the use of new Doppler methods for detecting longitudinal function abnormalities in a pacing-induced heart failure model. J Am Soc Echocardiogr 2003 ;16:424 -431. 3. Fukamachi K , Inoue M, Doi K, Schenk S, Nemeh H, Dessoffy R, Kopcak MW Jr., McCarthy PM. Device-based left ventricular geometry change for heart failure treatment: developmental work and current status. J Card Surg 2003 ;18 ( Suppl 2):S43-S47 . 4. Smith WA , McCarthy PM, Fukamachi K . Reading and writing in the field of mechanical circulatory support. ASAIO J 2003 ;49:511 -512. 5. Schenk S, Weber S, Luangphakdy V, Flick CR, Chen J-F, Inoue M, Kopcak MW, Jr., Ootaki Y, Doi K, Dessoffy R, Hirschman GB, Vitale NG, Chapman PA, Jr., Smith WA, Fukamachi K . In vivo performance and biocompatibility of the MagScrew ventricular assist device. ASAIO J 2003 ;49:594 -598. 1. Takagaki M, McCarthy PM, Tabata T, Dessoffy R, Cardon LA, Connor J, Ochiai Y, Thomas JD, Fukamachi K. Induction and maintenance of an experimental model of severe cardiomyopathy with a novel protocol of rapid ventricular pacing. J Thorac Cardiovasc Surg 2002 ;123:544 -549. 2. Doi K, Smith WA, Harasaki H, Takagaki M, Ochiai Y, Howard MW, Weber S, Byerman BP, Massiello AL, Vitale N, Donahue A, Hirschman G, Fukamachi K. In vivo studies of the MagScrew total artificial heart in calves. ASAIO J 2002 ;48:222 -225. 3. Ochiai Y, Golding LAR, Massiello AL, Medvedev AL, Horvath DJ, Gerhart RL, Chen J-F, Krogulecki AY, Takagaki M, Doi K, Howard MW, Fukamachi K. The Cleveland Clinic CorAide blood pump circulatory support without anticoagulation. ASAIO J 2002 ;48:249 -252. 4. Takagaki M, McCarthy PM, Dessoffy R, Ochiai Y, Doi K, Howard M, Qin J, Yang H, Shiota T, Connor J, Fukamachi K. Device based left ventricular shape change: validation of conductance technology in shape changed hearts. ASAIO J 2002 ;48:268 -271. 5. Fukamachi K, McCarthy PM, Powell B. The Myosplint implant procedure. Op Tech in Thor & CV Surg : A Comparative Atlas 2002 ;7:90 -102. 6. Fukamachi K, Ochiai Y, Doi K, Massiello AL, Medvedev AL, Horvath DJ, Gerhart RL, Chen J-F, Krogulecki AY, Takagaki M, Howard MW, Kopcak MW Jr., Golding LAR. Chronic evaluation of the Cleveland Clinic CorAide left ventricular assist system in calves. Artif Organs 2002 ;26:529 -533. 7. Takagaki M, McCarthy PM, Chung M, Connor J, Dessoffy R, Ochiai Y, Howard M, Doi K, Kopcak M, Mazgalev TN, Fukamachi K. Preload-adjusted maximal power: a novel index of left ventricular contractility in atrial fibrillation. Heart 2002 ;88:170 -176. 8. Ochiai Y, McCarthy PM, Smedira NG, Banbury MK, Navia JL, Feng J, Hsu AP, Yeager ML, Buda T, Hoercher KJ, Howard MW, Takagaki M, Doi K, Fukamachi K. Predictors of severe right ventricular failure after implantable left ventricular assist device insertion: analysis of 245 patients. Circulation 2002 ;106 [supple I]:I-198-I-202. 9. Weber S, Doi K, Massiello A, Byerman B, Takagaki M, Fukamachi K, Donahue A, Chapman P, Hirschman G, Vitale N, Smith WA. In vitro controllability of the MagScrew total artificial heart system. ASAIO J 2002 ;48:606 -611. 10. Fukamachi K. [New devices to treat dilated cardiomyopathy]. [Japanese] In: [Operative Techniques in Cardiovascular Surgery]. [Japanese] Koyanagi H, Kitamura S, Yasui H ( eds ). Tokyo : Institute of Advanced Medical Technology 2002, p.358-363. 1. Horvath D, Golding L, Massiello A. Medvedev A. Gerhart R, Ochiai Y, Krogulecki A, Fukamachi K. The CorAide blood pump. Ann Thorac Surg 2001 ;71 : S191. 2. Takagaki M, McCarthy PM, Ochiai Y, Dessoffy R, Doi K, Vidlund R, Mortier TJ, Schweich CJ, Fukamachi K. Novel device to change left ventricular shape for heart failure treatment: device design and implantation procedure. ASAIO J 2001 ;47:244 -248. 3. McCarthy PM, Takagaki M, Ochiai Y, Young JB, Tabata T, Shiota T, Qin JX, Thomas JD, Mortier TJ, Schroeder RF, Schweich CJ Jr., Fukamachi K. Device-based change in left ventricular shape: a new concept for the treatment of dilated cardiomyopathy. J Thorac Cardiovasc Surg 2001 ;122:482 -490. 4. Takagaki M, Rottenberg D, McCarthy PM, Smedira NG, Dessoffy R, Al- Ahmadi M, Shoshani D, Fukamachi K. A novel miniature ventricular assist device for hemodynamic support. ASAIO J 2001 ;47:412 -416. 5. Ochiai Y, Golding LAR, Massiello AL, Medvedev AL, Gerhart RL, Chen J-F, Takagaki M, Fukamachi K. In vivo hemodynamic performance of the Cleveland Clinic CorAide blood pump in calves. Ann Thorac Surg 2001 ;72:747 -752. 6. Fukamachi K. [Partial left ventriculectomy and new devices]. [Japanese] In: [The newest therapy for heart diseases]. [Japanese] Kawashima Y, Hosoda S, Shinoyama J ( eds ). Tokyo : Institute of Advanced Medical Technology ; 2001, p.240-246. 1. Armstrong G, Pasquet A, Fukamachi K, Cardon L, Olstad B, Marwick T. Use of peak systolic strain as an index of regional left ventricular function: comparison with tissue Doppler velocity during dobutamine stress and myocardial ischemia. J Am Soc Echocardiogr 2000 ;13:731 -737. 1. Armstrong GP, Calier SC, Fukamachi K, Thomas JD, Marwick TH. Estimation of cardiac reserve by peak power: validation and initial application of a simplified index. Heart 1999 ;82:357 -364. 2. Fukamachi K, McCarthy PM, Smedira NG, Vargo RL, Starling RC, Young JB. Preoperative risk factors for right ventricular failure after implantable LVAD insertion. Ann Thorac Surg 1999 ;68:2181 -2184. 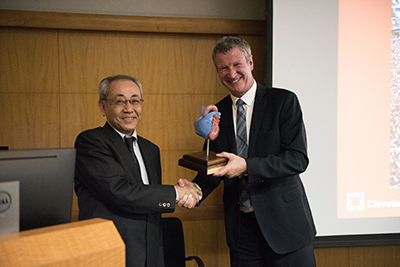 On May 8, the Cardiovascular Dynamics Laboratory of Kiyotaka Fukamachi, MD, PhD, Department of Biomedical Engineering, celebrated its 20-year anniversary with a special seminar. The reunion of several former lab members and a number of colleagues and coauthors made the day special.